The Toronto Flair League’s first season was incredibly successful. The promoters were overwhelmed with the interest and passion shared not only by the competitors, but with the fans as well. In the past six months, the interest in the sport of flair bartending has risen faster than ever in the city of Toronto. Season 2 promised to be bigger and better. One of the most notable changes was the addition of a third division. Instead of having advanced and amateur divisions, the TFL now is comprised of A, B, and C divisions. This change opened the doors for the jam packed B division, (formerly the advanced division) competitors because the top 6 bartenders from season 1 were moved into the A division. With the talent spread very evenly throughout the B division, the competition level is higher than ever before. February 23 2011 marked the start of season 2. There were three new competitors joining the C division including Yuki Yamazaki, Terri Lee, and Louis Brosas who were competing for the very first time. As usual, the Loose Moose was close to capacity to witness the biggest showcase of flair bartending skills that Toronto has ever seen. Heading into the show, odds makers had Dustin “Flair Bear” Costain as the favorite for the B division, followed closely by Jeremy Janes, Mauro Pento, Jeremy Browes, and Shay Court. The TFL’s first 5 minute A division round kicked off with Alejandro Giraldo throwing down a near flawless routine. At the end of the night, the crowd was eager with anticipation to find out the results for all 3 divisions. In the C division, taking home third place was newcomer Louis Brosas. Second place went to Yann, and taking home the C division championship was Pierre Gadouas of Montreal. In the B division, coming in third place and the $40 prize was the Loose Moose’s own Jay Myers. Second place and the $60 prize went to Jeremy Browes, and taking home the $100 prize and the first season 2 championship was “Flair Bear” Dustin Costain. The A Division saw Kris Perez take third place. Season 1 champion David Jennings took home second place, and the first ever Division A champion was Alejandro Giraldo who claimed the $150 prize. Another successful competition by the Toronto Flair League is proof of the rising interest in flair bartending in the city of Toronto. 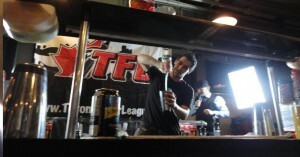 There are few bartending schools in Toronto that promote, and properly train bartenders in the art of flair. BartenderOne is responsible for training over 80% of the bartenders in the TFL, and Flair Studios Canada has also done a great job preparing bartenders for competition. Moving forward, the Toronto Flair League will be incorporating themes into their competitions to make the guest experience that much better. Watch out for TFL 80’s night in late March. 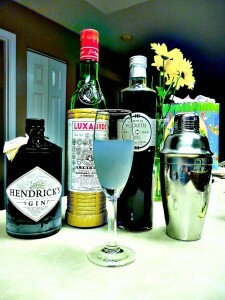 The Aviation -- A mouth watering classic cocktail!